Published Jan 2007 by Del Rey. 1st printing. By Timothy Zahn. The destruction of the Death Star was a decisive blow against the Empire, but Palpatine and his monstrous enforcer, Darth Vader, are no less of a threat. Standing against them are Luke Skywalker, Han Solo, and Princess Leia Organa, sent to mediate a dispute between Rebel Alliance factions in Shelsha Sector. At the same time, Mara Jade serves her evil master, Palpatine, tracking suspected treachery in the Empire. 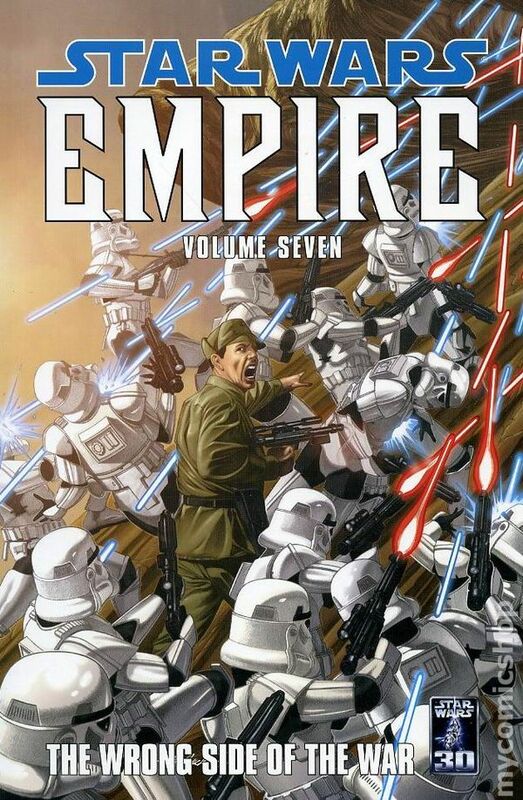 But the Rebels will prove to be only one of the Empire's concerns, for Imperial Stormtrooper Daric LaRone will commit a sudden and violent act of defiance! Each of these fateful actions will expose brutality and corruption, spur upheavals destined to shake the Empire to its core, and shape momentous events yet to come! Hardcover, 6 1/2-in. x 10-in., 326 pages, text only. Cover price $25.95. Volume 7 - 1st printing. Explosive action, white-hot lightsaber battles, evil schemes, and heroic sacrifices - it's all here in this fast-paced volume jam-packed with four wickedly awesome all-ages adventures set in the most exciting era of Star Wars! The fate of the galaxy hangs in the balance, the Republic and Confederacy taking their fight from the cold reaches of space to exotic alien worlds. Don't miss the Jedi make history in their selfless fight for justice in this full-throttle collection of stories all told in the same stripped-down stylization as Cartoon Network's micro-series. ? 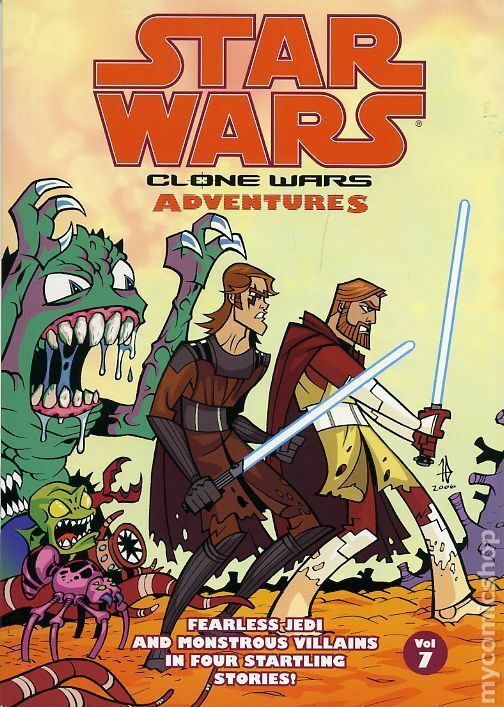 The Clone Wars Adventures series are a top seller, and very kid-friendly, perfect for younger readers. ? The stories contained in this book are based on the popular Cartoon Network micro-series and showcase the same visual sensibilities and exciting, stripped down style. Softcover, 5 1/2-in. x 7 1/2-in., 96 pages, full color. Cover price $6.95. 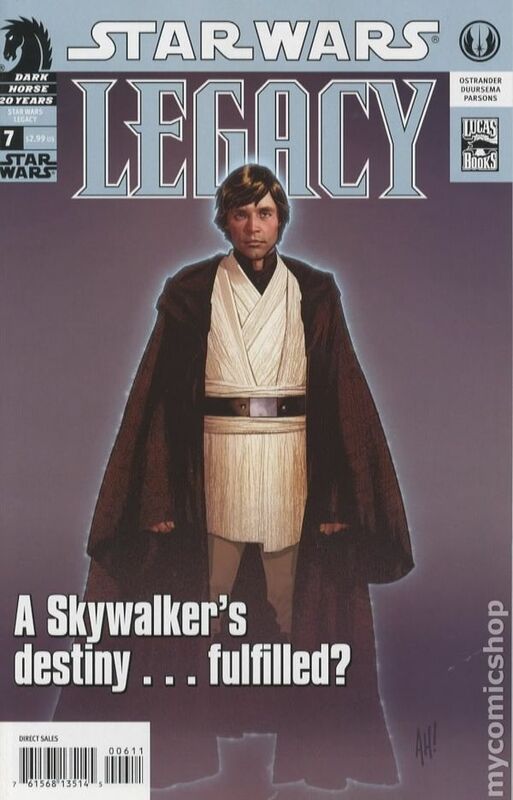 Star Wars Comic Pack comics originally came packaged with Star Wars action figures and reprint the comic title & issue displayed on the cover. 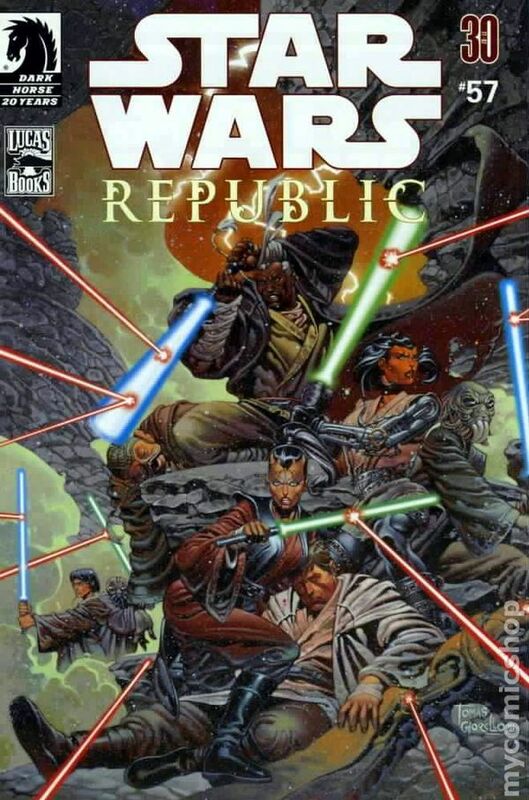 This issue reprints: Star Wars Republic #57. Published 2007 (est.) by Dark Horse. 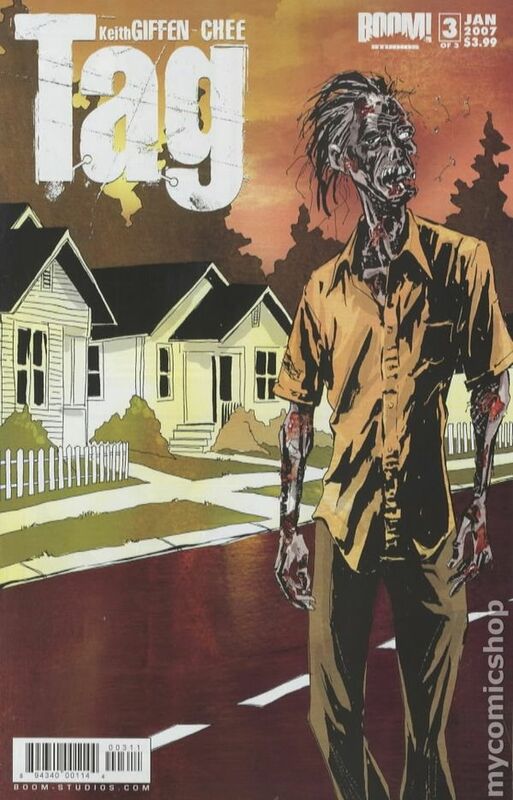 Published Jan 2007 by Del Rey Books. 1st printing. By Michael Reaves and Steve Perry. The Death Star's name says it all, with bone-chilling accuracy. It is a virtual world unto itself, equipped with uncanny power for a singularly brutal purpose - to obliterate entire planets in the blink of an eye. Its annihilation of the planet Alderaan, at the merciless command of Grand Moff Tarkin, lives in infamy. And its own ultimate destruction, at the hands of Luke Skywalker, is the stuff of legend. But what is the whole story, and who are the players, behind the creation of this world-killing satellite of doom? From inception to completion, construction of the unprecedented Death Star is awash in the intrigues, hidden agendas, unexpected revelations, and daring gambits of those involved on every level. 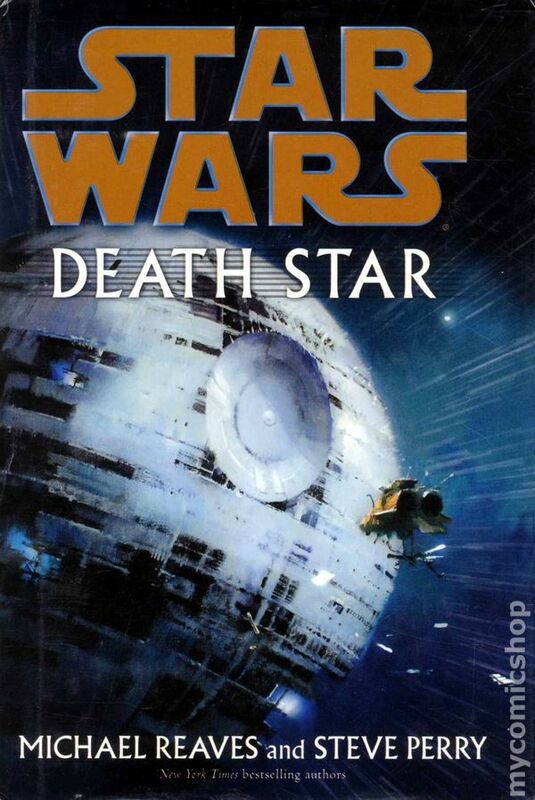 The brightest minds and boldest egos, the most ambitious and corrupt, the desperate and the devious, all have a stake in the Death Star - and its potential to control the fate of the galaxy. Hardcover, 6-in. x 9 1/2-in., 364 pages, Text Only. Cover price $25.95. Volume 7 - 1st printing. "Wrong Side of the War!" Collects Star Wars: Empire (2002) #36-40. Fresh from the killing fields of Jabiim, where the Empire has virtually wiped out the populace of that world, Imperial Lieutenant Janek Sunber is sent to the quiet prison base on Kalist VI. But, unbeknownst to the Empire, the Rebels have designs on Kalist Base both for its desirable fuel supplies, and for the presence of a very important prisoner-one of their own who has already attracted the interest of Darth Vader. Sunber doesn't know it, but he's on a collision course with an old friend who is with the Rebels, and he finds himself wondering which of them is on the wrong side of the war. ? Just in time for the thirtieth anniversary of Star Wars comes a story that reintroduces a character not mentioned since A New Hope! ? Softcover, 128 pages, full colr. Cover price $17.95. 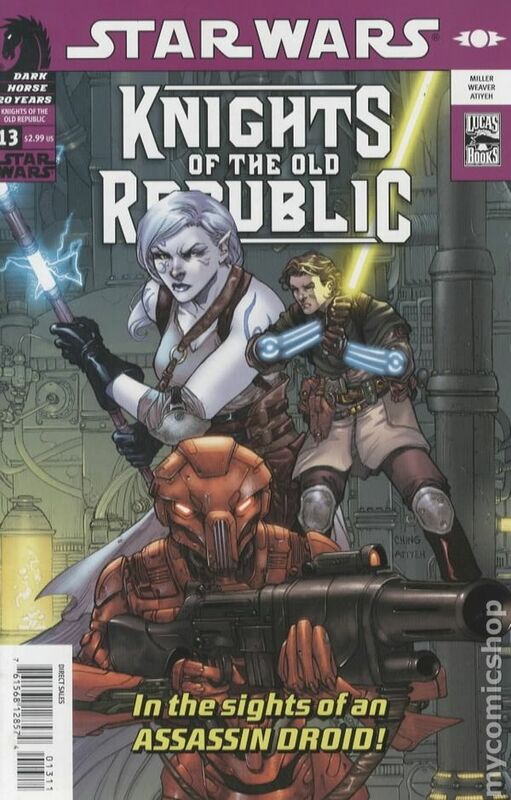 A perfect jumping-on point for new readers, the wildest space adventure in the Old Republic begins a new story arc featuring stolen starships, killer droids, and the debut of a dangerous villain! When fugitive Padawan Zayne Carrick and his small-time con artist cohort Gryph part ways with their friends on the Last Resort, the odd couple sets out to score a new ship. Soon enough, the two find that helping themselves to something they can't afford carries a much higher price than they bargained for! Meanwhile, a sinister power from across the galaxy begins hunting the Last Resort, determined to stop at nothing until the ship's owners are within his grasp! Cover price $2.99. 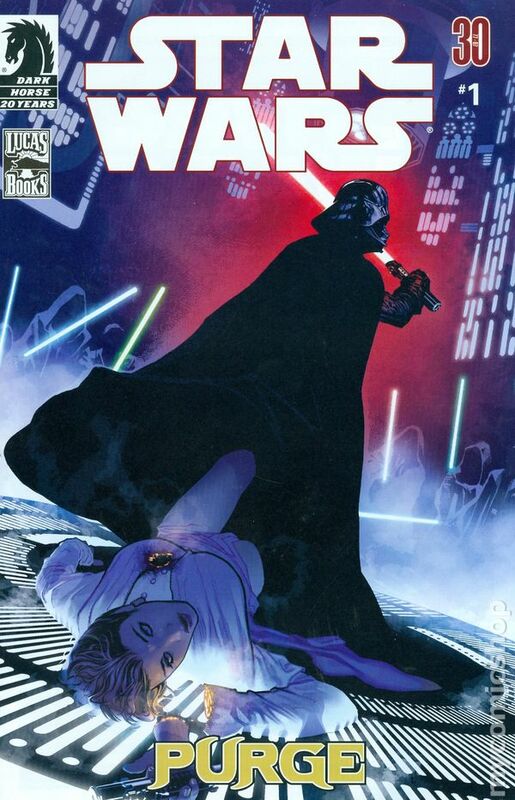 JOHN OSTRANDER (W), JAN DUURSEMA (P), DAN PARSONS (I), BRAD ANDERSON (C), and ADAM HUGHES (Cover) Lightsaber crashes against lightsaber in a battle between Jedi and Sith that marks a crucial turning point in the fate of the galaxy! The life of a central figure hangs in the balance, triggering Cade Skywalker to make a shocking choice that will challenge everything he's fought so hard to protect, and start him down a path from which he can never return. The stakes are higher than ever before in the Star Wars universe?be there as the future of this epic saga is revealed! ? This is the future of Star Wars, the continuation of the story that started in the original trilogy, and none of it has been seen before. FC, 32 pages. Cover price $2.99. 1st printing. By Troy Denning. Picking up where the startling events of Star Wars: Legacy of the Force - Sacrifice left off, Inferno carries the saga's classic heroes further into new dimensions of adventure! Hardcover, 5 1/2-in. x 8-in., 312 pages. Text Only. NO Dust Jacket - 1st printing. By Troy Denning. Picking up where the startling events of Star Wars: Legacy of the Force - Sacrifice left off, Inferno carries the saga's classic heroes further into new dimensions of adventure! Hardcover, 5 1/2-in. x 8-in., 312 pages. Text Only. 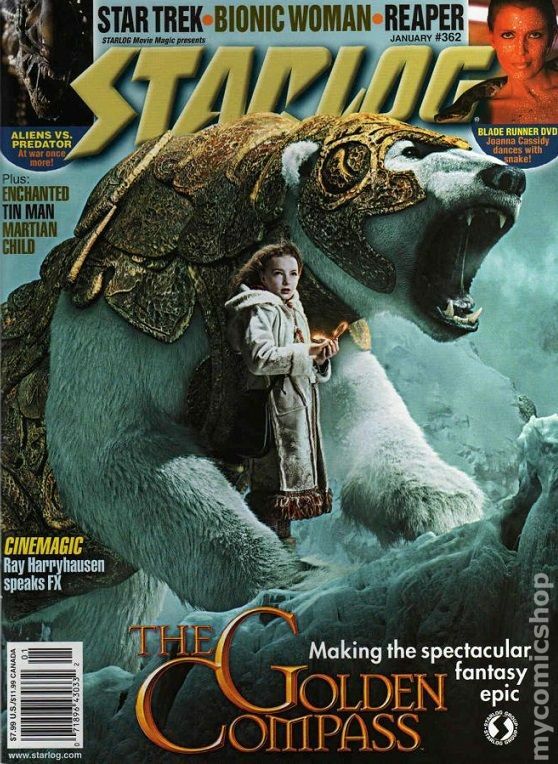 Published Jan 2007 by Visual Imagination Ltd..
Starburst is Britain's "premier magazine of sci-fi entertainment." Issue #345 includes: Doctor Who's back - director Euros Lyn reveals the Doctor's newest enemies, plus spin-offs The Sarah Jane Adventures & Torchwood...and Tom Baker. Also: Star Trek - Nichelle Nichols on Uhura's return; Black Christmas - Lacey Chabert on her creepy new movie; Day Break - star Taye Diggs is trapped in time; Primeval - facing dinosaurs in the new sci-fi series. Cover price $7.99. By J.M. DeMatteis & Mike Ploog. The award-winning, critically acclaimed team from Abadazad finishes their latest epic! The big finale features an extra 10 pages of story at no additional cost, pushing the page count from 22 pages to 32! Finally, all questions are answered and the series comes to a conclusion! With Abadazad relaunched by Hyperion/Disney, don't miss out on this opportunity to read the latest fantasy franchise from two masters of the medium! 32pgs, FC (5 of 5) Cover price $3.50. 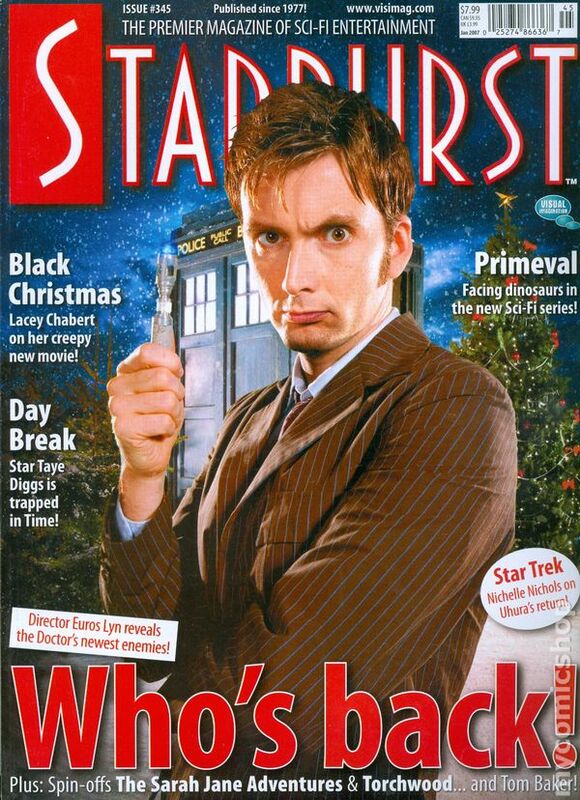 Published Jan 2007 by Starlog. Jan 2007. 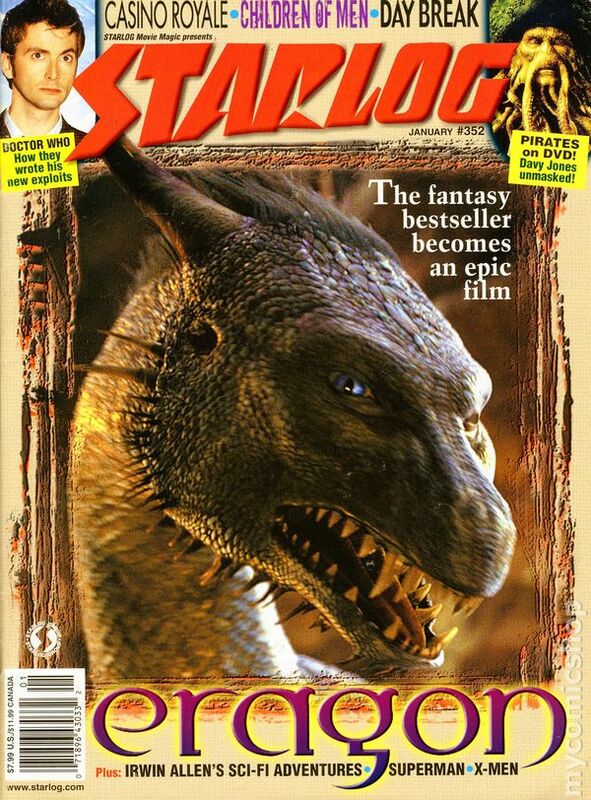 Eragon - the fantasy bestseller becomes an epic film; Doctor Who - how they wrote his new exploits; Pirates of the Caribbean on DVD - Davy Jones unmasked; Irwin Allen's sci-fi adventures; plus: Superman, X-Men, Casino Royale, Day Break, Children of Men. Eragon cover. Cover price $7.99. The Golden Compass, Ray Harryhausen, Star Trek, Bionic Woman, Reaper. 90 pages, FC. Cover price $7.99. Marvel Premiere Edition - 1st printing. 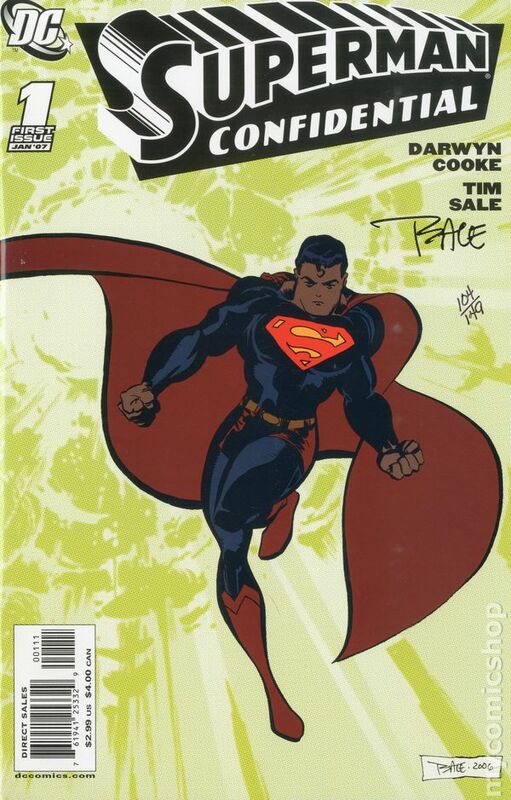 Collects Storm (2006 2nd Series) #1-6. Written by ERIC JEROME DICKEY. Art by DAVID YARDIN and LAN MEDINA. 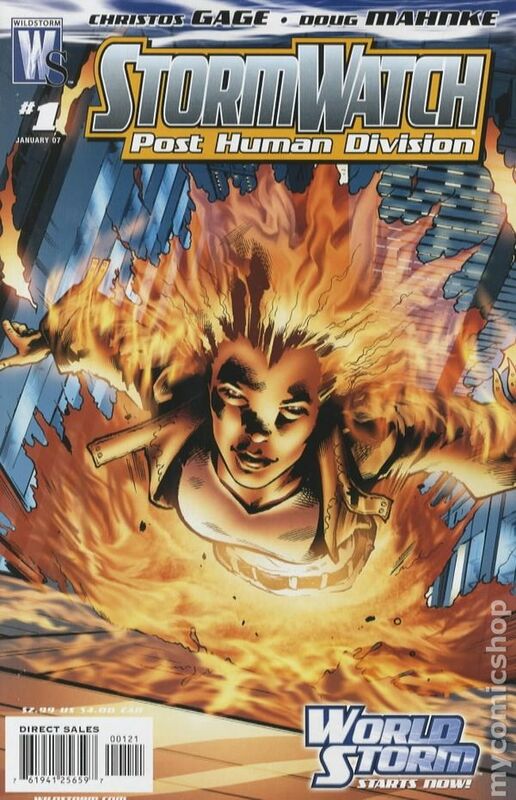 Cover by MIKE MAYHEW. The epic, untold love story between Marvel's two pre-eminent black super heroes - Storm and the Black Panther - is finally told, as only New York Times best-selling author Eric Jerome Dickey can do it! An orphaned street urchin, living by her wits on the unforgiving plains of Africa as she struggles to harness her slowly developing mutant powers. A warrior Prince, embarking on his rite of passage as he ponders the great responsibility in his future. And a crew of ruthless mercenaries who'll stop at nothing to capture an elusive creature of legend: the fabled wind-rider. What sparks occur when their paths intersect? Don't miss out on this prelude to the wedding of Storm and the Black Panther! Hardcover, 160 pages, full color. Cover price $19.99. Marvel Premiere Edition (Variant Cover) - 1st printing. Collects Storm (2006 2nd Series) #1-6. Written by ERIC JEROME DICKEY. Art by DAVID YARDIN and LAN MEDINA. 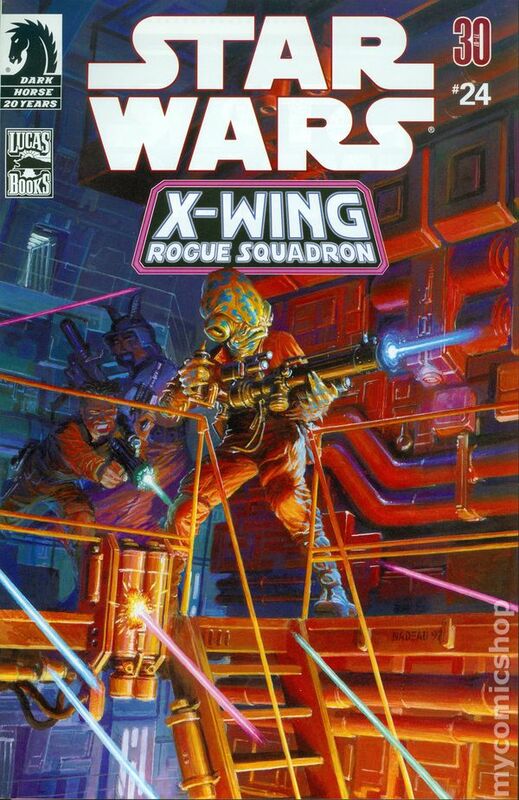 Cover by MIKE MAYHEW. The epic, untold love story between Marvel's two pre-eminent black super heroes - Storm and the Black Panther - is finally told, as only New York Times best-selling author Eric Jerome Dickey can do it! An orphaned street urchin, living by her wits on the unforgiving plains of Africa as she struggles to harness her slowly developing mutant powers. A warrior Prince, embarking on his rite of passage as he ponders the great responsibility in his future. And a crew of ruthless mercenaries who'll stop at nothing to capture an elusive creature of legend: the fabled wind-rider. What sparks occur when their paths intersect? 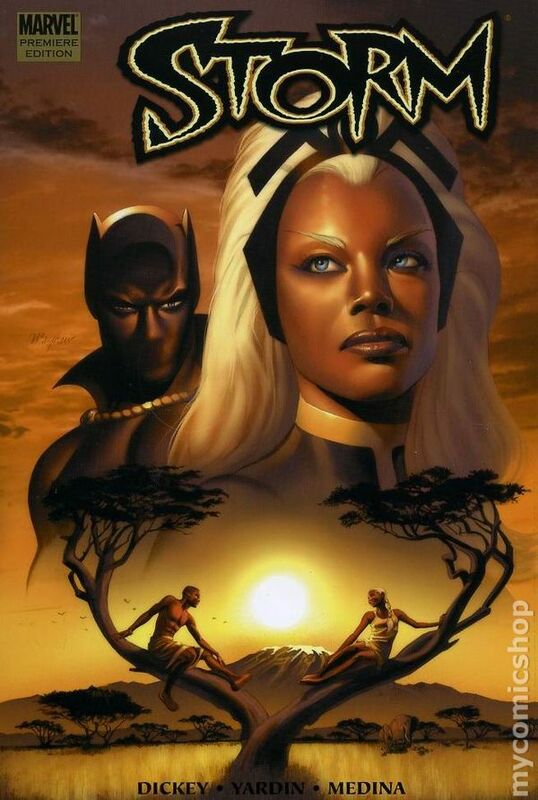 Don't miss out on this prelude to the wedding of Storm and the Black Panther! Hardcover, 160 pages, full color. Cover price $19.99. Written by Christos N. Gage. Art and cover by Doug Mahnke Variant covers by Trevor Hairsine The excitement of WorldStorm continues as Christos Gage (DEADSHOT, TVs Numb3rs) and Doug Mahnke (JLA, TEAM ZERO) bring an incredible new vision to this WildStorm Universe cornerstone! Originally a U.N. crisis intervention force with a global reach, StormWatch suffered a very visible and crippling blow following a catastrophe in New York City. With their limitations now exposed, facing budget cuts and internal gutting, former Weatherman Jackson King is tasked with a near-impossible mission: develop new methods of superpowered-being apprehension and containment on a shoestring budget. Gone are the fancy orbital satellites and matter-teleportation services, traded for a dingy office staffed with second-rate heroes and former villains to combat the growing crisis of post-human threats. Does humanity ? and this Post Human Division ? stand a chance? Retailers: This issue will feature 3 covers that may be ordered separately. 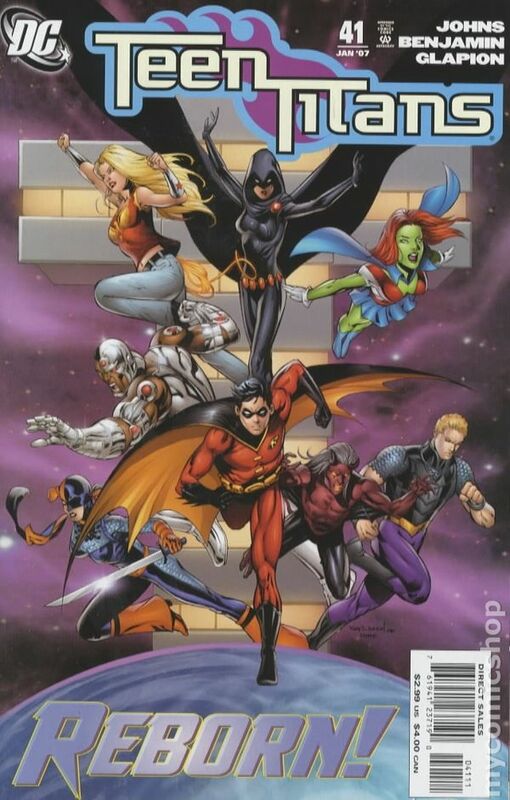 The Standard Edition cover is by Doug Mahnke; one copy of Variant Edition A, with a cover by Trevor Hairsine, may be ordered for every 10 copies of the Standard Edition ordered; one copy of Variant Edition B, with a pencil version of the cover by Trevor Hairsine, may be ordered for every 50 copies of the Standard Edition ordered. Please see the Previews Order Form for further details. On sale November 8 ? 32 pg, FC, $2.99 USEdited by Ben Abernathy Cover price $2.99. 1 in 10 Variant cover by Trevor Hairsine. Written by Christos N. Gage Art and cover by Doug Mahnke. 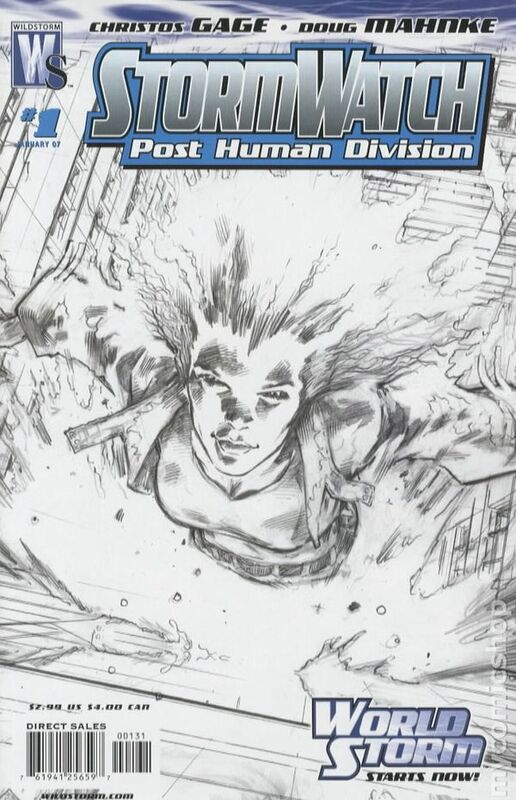 The excitement of WorldStorm continues as Christos Gage (DEADSHOT, TVs Numb3rs) and Doug Mahnke (JLA, TEAM ZERO) bring an incredible new vision to this WildStorm Universe cornerstone! 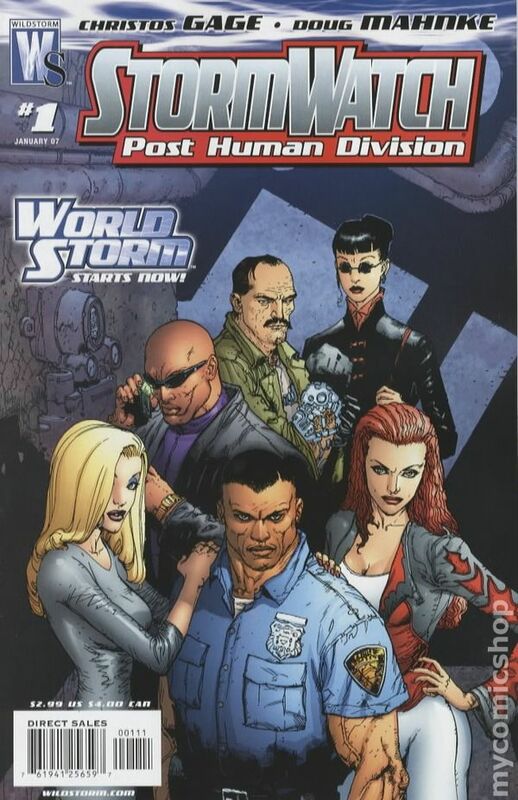 Originally a U.N. crisis intervention force with a global reach, StormWatch suffered a very visible and crippling blow following a catastrophe in New York City. With their limitations now exposed, facing budget cuts and internal gutting, former Weatherman Jackson King is tasked with a near-impossible mission: develop new methods of superpowered-being apprehension and containment on a shoestring budget. Gone are the fancy orbital satellites and matter-teleportation services, traded for a dingy office staffed with second-rate heroes and former villains to combat the growing crisis of post-human threats. Does humanity ? and this Post Human Division ? stand a chance? Retailers: This issue will feature 3 covers that may be ordered separately. 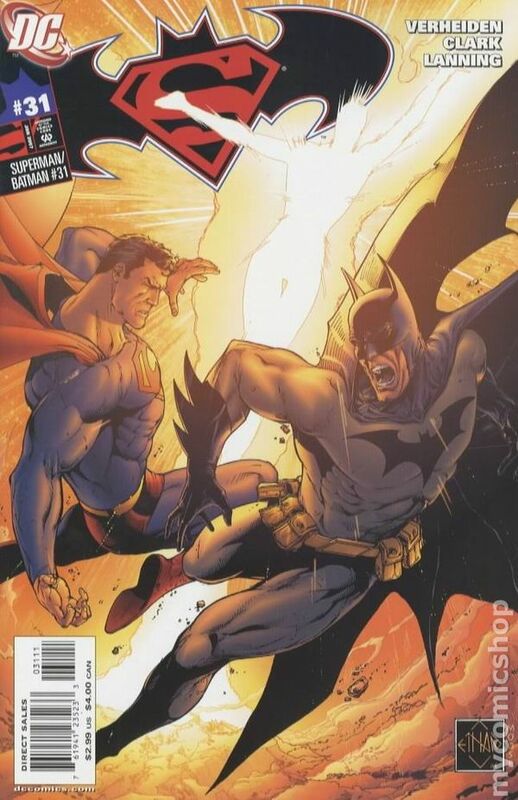 The Standard Edition cover is by Doug Mahnke; one copy of Variant Edition A, with a cover by Trevor Hairsine, may be ordered for every 10 copies of the Standard Edition ordered; one copy of Variant Edition B, with a pencil version of the cover by Trevor Hairsine, may be ordered for every 50 copies of the Standard Edition ordered. Please see the Previews Order Form for further details. On sale November 8 ? 32 pg, FC, $2.99 USEdited by Ben Abernathy Cover price $2.99. 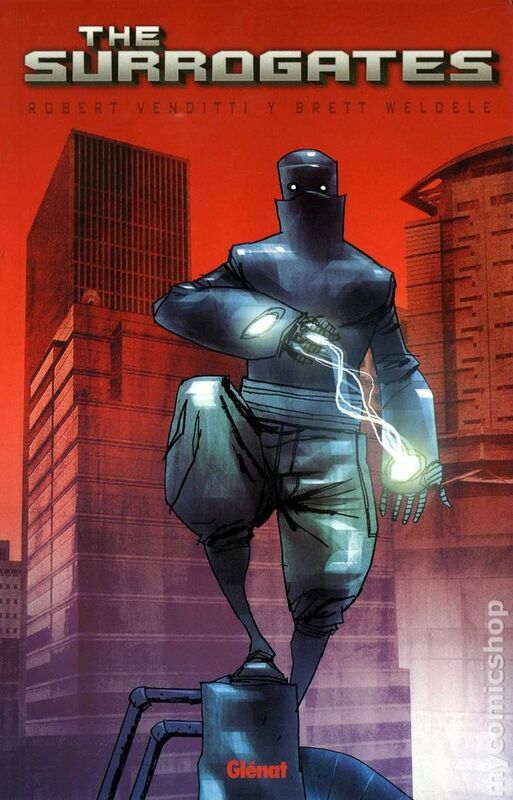 Story RICK REMENDER. Art & cover NICK STAKAL. Trapped in Hell, Bethany is forced into her own private room where she is forced to face the demons that live in her past. Psychological horror in Hell illustrated by rising star Micah Farritor! 32 PAGES FC Cover price $2.99. Published Jan 2007 by Image/Abstract. By Terry Moore. With only four issues remaining, this series has never been hotter! Will the story of Francine and Katchoo turn out to be a romantic comedy or a tragedy? Will David live or die? What the heck was that flash forward business all about? Moore promises answers to all these questions as SIP approaches its final climax! 24pgs, B&W Cover price $2.99. 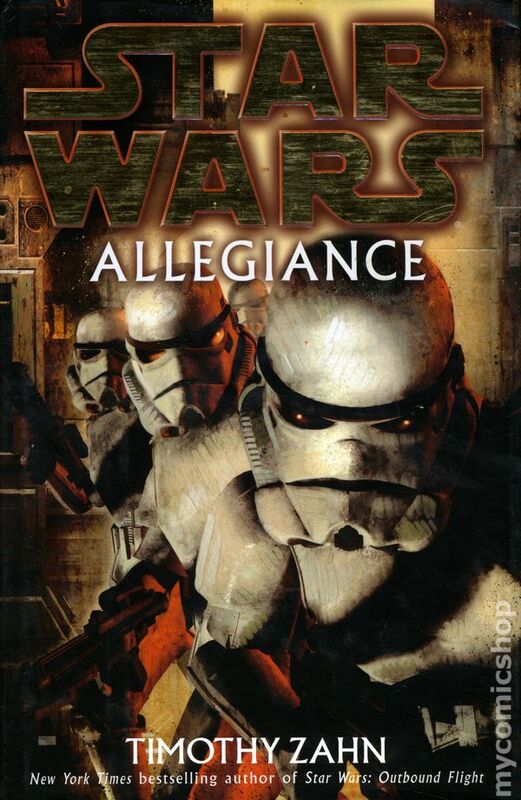 Published Jan 2007 by Decision Games. 1066: End of the Dark Ages - Strategy & Tactics magazine is the longest running military history magazine. Includes in-depth looks at historical battles and campaigns and features articles with maps and pictures showing key moments, action, personalities, equipment and more! 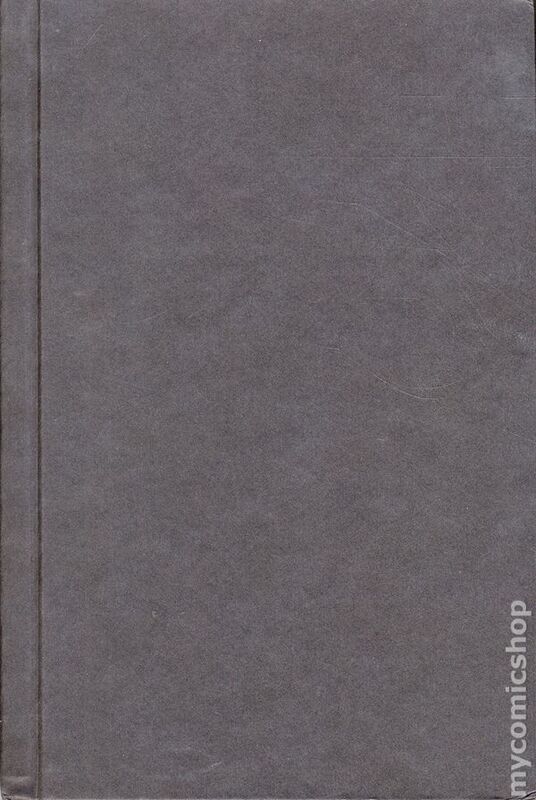 Softcover (Saddle-Stitched/Stapled), 8 1/2-in. x 11-in., 64 pages, B&W. 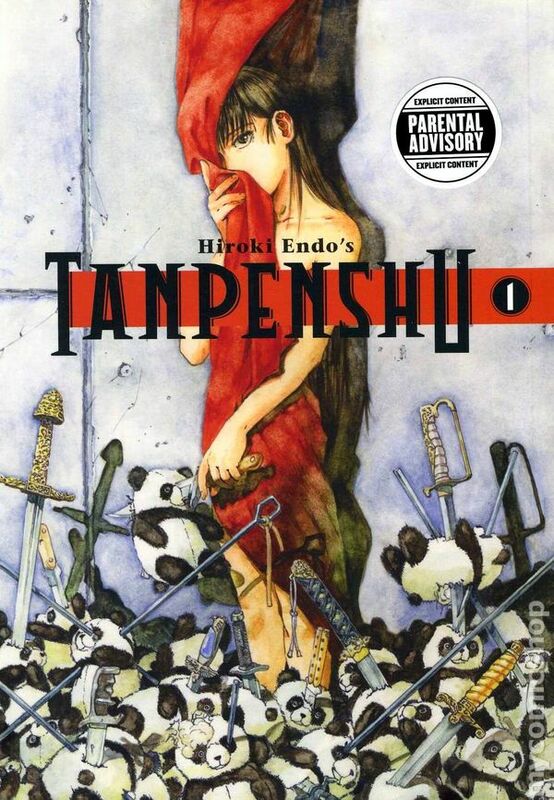 Published Jan 2007 by Udon Comics. Volume 1 - 1st printing. Story and art by Masaomi Kanzaki. 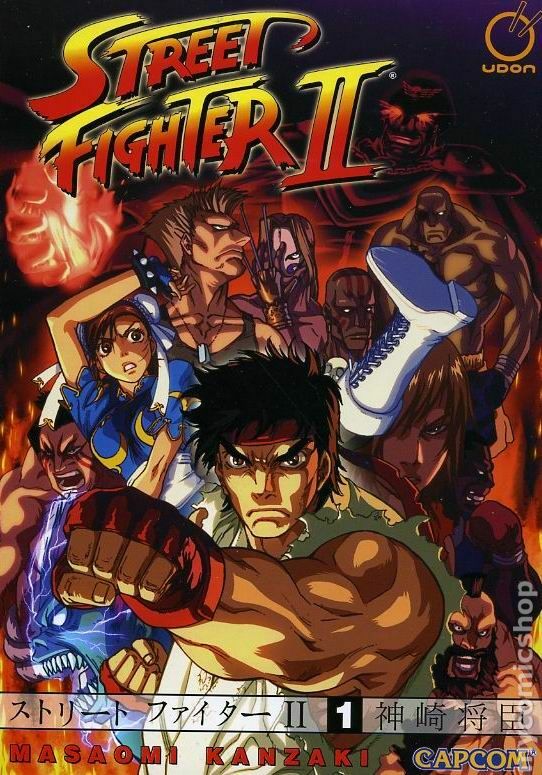 Ryu, Chun-Li, Sagat, Zangief, and the rest of the greatest fighters from around the world face off in the ultimate martial arts tournament. But behind the scenes, an evil crime boss has a hidden agenda - to use the world's greatest warrior as his next living weapon! Street Fighter II goes back to the franchise's roots with more martial arts mayhem than a Bruce Lee marathon! Softcover, 5 1/2-in. x 8-in., B&W. NOTE: These are Japanese manga-style GNs and are meant to be read right-to-left. Cover price $12.95. Published Jan 2007 by Rebellion. Volume 1 - 1st printing. Written by John Wagner and Alan Grant. Art by Carlos Ezquerra. Following the Atom Wars in the 22nd Century, many of the survivors were mutated by the Strontium 90 fallout. Unable to get regular jobs, forced into ghettoes and considered an underclass by the "norms," the only work open to them was bounty hunting. These Search Destroy Agents - or Strontium Dogs - hunt the criminals too dangerous for the Galactic Crime Commission. Softcover, B&W. Cover price $28.99. Published Jan 2007 by Sigma Theta Publications. "Going Out with a Bang" written by Michael S. Finger with art by Willie Peppers. Full color, 24 pages, standard paper stock. Cover price $2.99. Written by Jimmy Palmiotti & Justin Gray with art by Amanda Conner. The Girl of Steel is down in the dumps - and no match for a monster that's using her emotions as a weapon. This looks like a job for a Terra, a mysterious new hero whose very steps make the ground tremble to make her presence known to the world. ? 32 pg, FC Cover price $2.99. Written by Mark Waid. 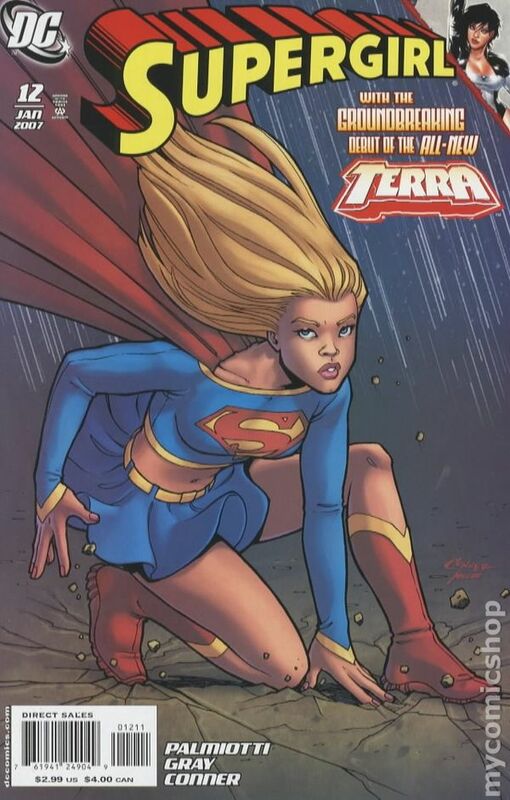 Art by Barry Kitson & Mick Gray Cover by Kitson The team struggles against a Legion of Super-Powered Villains that may be connected to the mysteries surrounding Supergirl. Plus, the return of a Legionnaire you never thought you'd see again. And just who is Tarik the Mute? ? 32 pg, FC Cover price $2.99. Written by Kurt Busiek. Art and cover by Carlos Pacheco & Jesus Merino. In a horrific future where heroes, villains and lunatics are fighting to the death for what's left of the world, Superman finally returns! But can even he save the planet? And which threat from this future is coming back to haunt the past? ? 32 pg, FC Cover price $2.99. Written by Mark Schultz. Art and cover by Ariel Olivetti. It's the battle you've been waiting for in a thrilling 2-issue miniseries by Mark Schultz (Cadillacs & Dinosaurs) with computer-generated painted art by Ariel Olivetti (SPACE GHOST)! They're back! The relentless killing machines known as Aliens and the unstoppable race of hunters called Predators have returned to Earth. But saying 'they're back' isn't quite accurate - Batman discovers that the two races, sealed away from the human population, have been here all along! 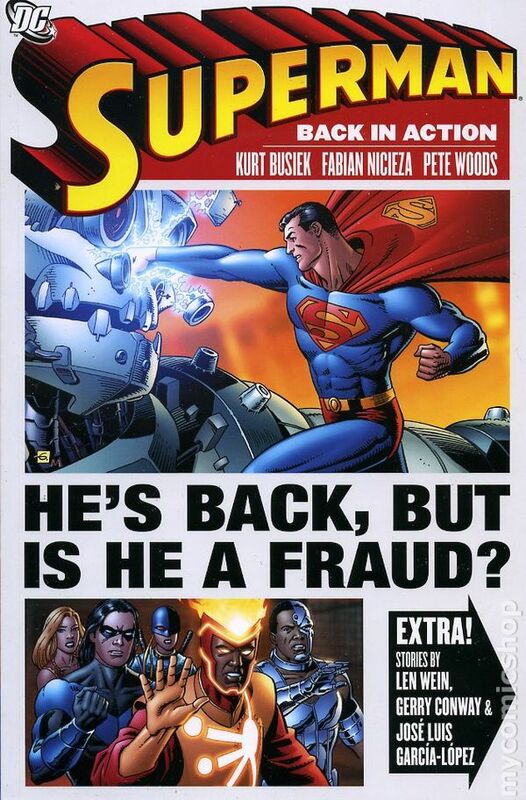 Can he and Superman get them off our world before they threaten the planet's existence? Co-published with Dark Horse Comics. Prestige Format ? 48 pg (no ads), FC Edited by Joey Cavalieri Cover price $5.99. 1st printing. Collects ACTION COMICS #841-843 and DC Comics Presents (1978-1986 DC) #4, 17, and 24. Written by Kurt Busiek, Fabian Nicieiza, Len Wein, and Gerry Conway. Art by Pete Woods and José Luis García-López. Cover by Dave Gibbons. An alien race is collecting unique specimens from Earth - and the Man of Steel is first on the list! Plus,Kurt Busiek introduces stories from DC COMICS PRESENTS #4, #17 and #24! Guest-starring Nightwing, Aquaman, Firestorm, the Metal Men, Deadman and more. Softcover, 144 pages, full color. Cover price $14.99. Written by Mark Verheiden. Art by Matt Clark & Andy Lanning. Cover by Ethan Van Sciver. 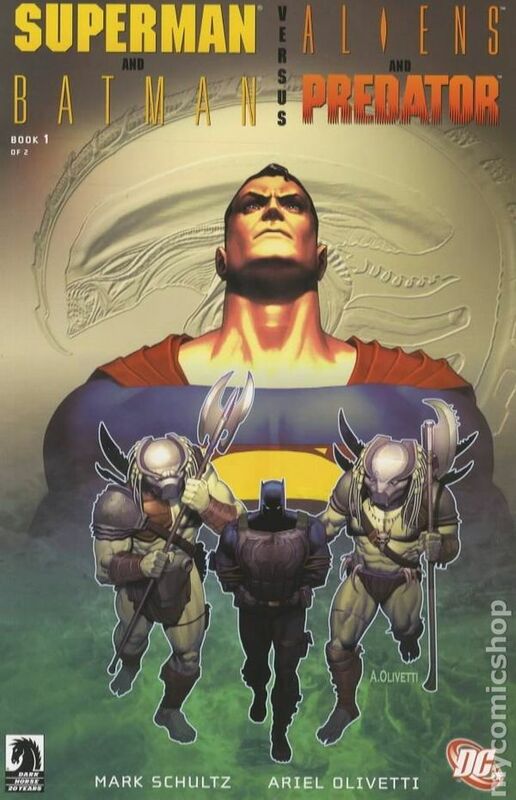 Lex Luthor enlists Batman to raid Superman's Fortress of Solitude in the hope of stopping the alien madness that has gripped all the outworlder heroes, but he must evade a Titan and get help from an unlikely Justice Leaguer! ? 32 pg, FC Cover price $2.99. Written by Darwyn Cooke Art and cover by Tim Sale. Don't miss this first 6-part story arc in a brand-new ongoing Superman series, brought to you by the award-winning writer Darwyn Cooke (DC: The New Frontier) and artist Tim Sale (Superman: For All Seasons, Batman: Dark Victory)! Superman Confidential tells stories from key moments in the history of Superman. First up: the secrets of Kryptonite! Witness Superman's first encounter with the radioactive chunks of his home planet and learn how it changed his life. ? 32 pg, FC Edited by Mark Chiarello Cover price $2.99. Dynamic Forces Signed Edition. Signed and numbered by Tim Sale. Limited to 149 copies. Includes Dynamic Forces certificate of authenticity. Written by Darwyn Cooke Art and cover by Tim Sale. Don't miss this first 6-part story arc in a brand-new ongoing Superman series, brought to you by the award-winning writer Darwyn Cooke (DC: The New Frontier) and artist Tim Sale (Superman: For All Seasons, Batman: Dark Victory)! Superman Confidential tells stories from key moments in the history of Superman. First up: the secrets of Kryptonite! Witness Superman's first encounter with the radioactive chunks of his home planet and learn how it changed his life. ? 32 pg, FC Edited by Mark Chiarello Cover price $2.99. 1st Edition - 1st printing. 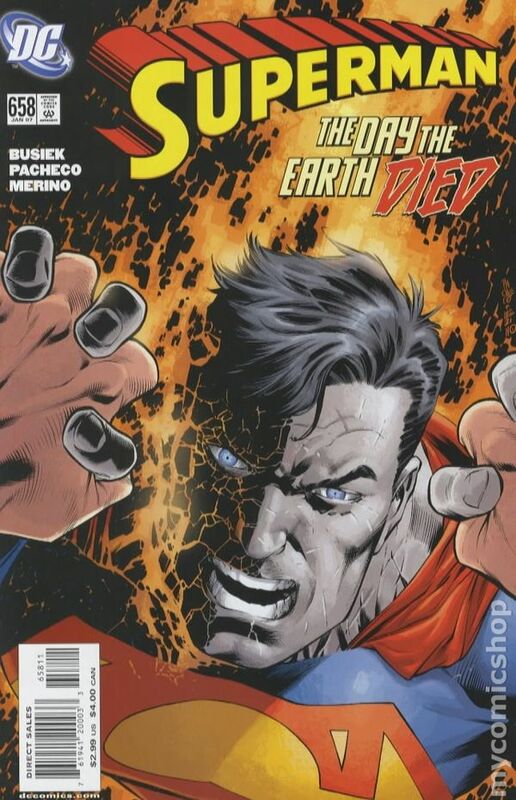 Collects Superman (1987-2011 2nd Series) #160-161, Adventures of Superman (1987-2006) #582-583, Superman: The Man of Steel (1991-2003) #104-105, Action Comics (1938-2011 DC) #769-770 and Superman: Emperor Joker (2000). 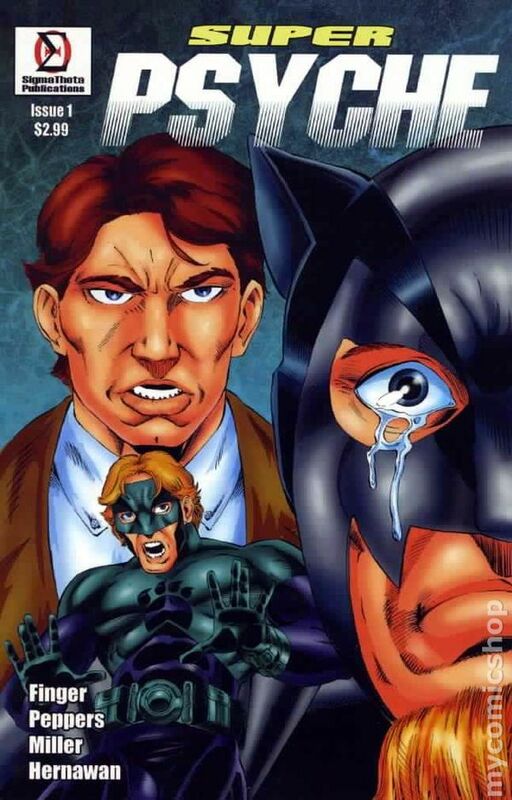 Written by Jeph Loeb, J.M. DeMatteis, Joe Kelly and Mark Schultz. Ed McGuinness, Doug Mahnke, and Todd Nauck. McGuinness. Collecting an unforgettably twisted Superman story! 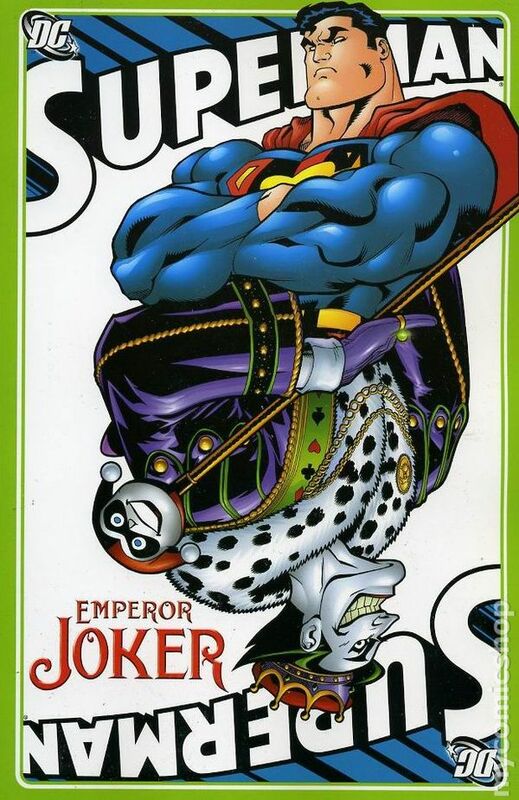 In this tale of a world gone wrong, a hunted Superman must struggle against the Joker, Emperor of the universe. Softcover, 256 pages, full color. Cover price $14.99. Published Jan 2007 by Glenat. Spanish Text - 1st printing. 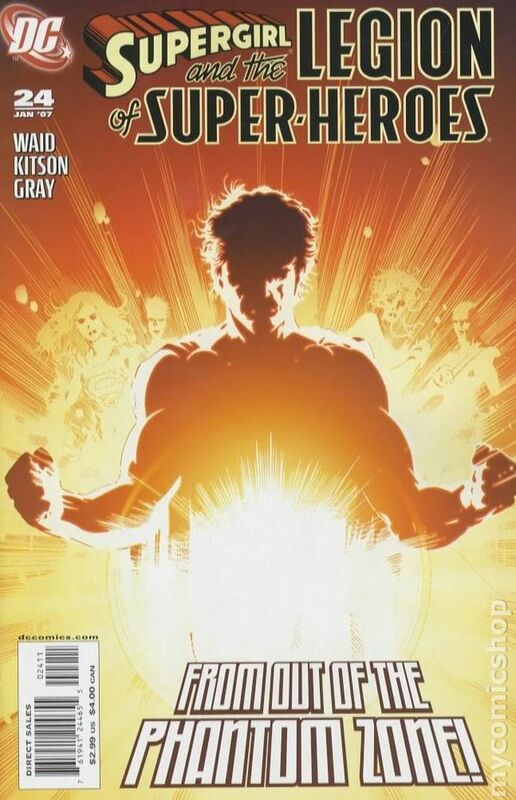 Collects Surrogates (2005) #1-5. Written by Robert Venditti. Art by Brett Weldele. This trade paperback collects all five issues of the critically acclaimed mini-series, and it's packed with never-before-seen sketches and artwork, as well as commentary from the creative team that brought this breakout story to the page. The year is 2054, and life has been reduced to a data feed. The fusing of virtual reality and cybernetics has ushered in the era of the personal surrogate, android substitutes that let users interact with the world without ever leaving their homes. It's a perfect world, and it's up to Detectives Harvey Greer and Pete Ford of the Metro Police Department to keep it that way! Softcover, 200 pages, full color. NOTE: All text is in Spansih. Cover price $19.95. Second Printing. 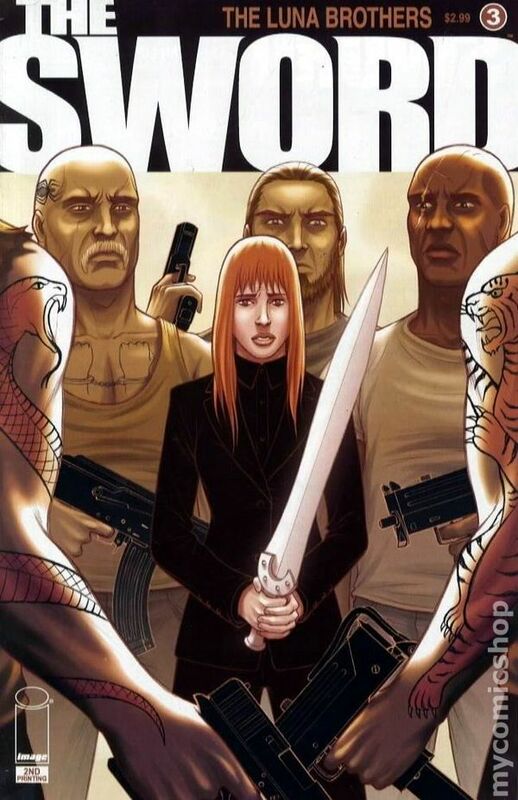 Dara's involvement with the sword propels her into a world of extreme danger as the three powerful strangers stop at nothing to get a hold of her. What will she do when her best defense is the object of her suffering? Cover price $2.99. 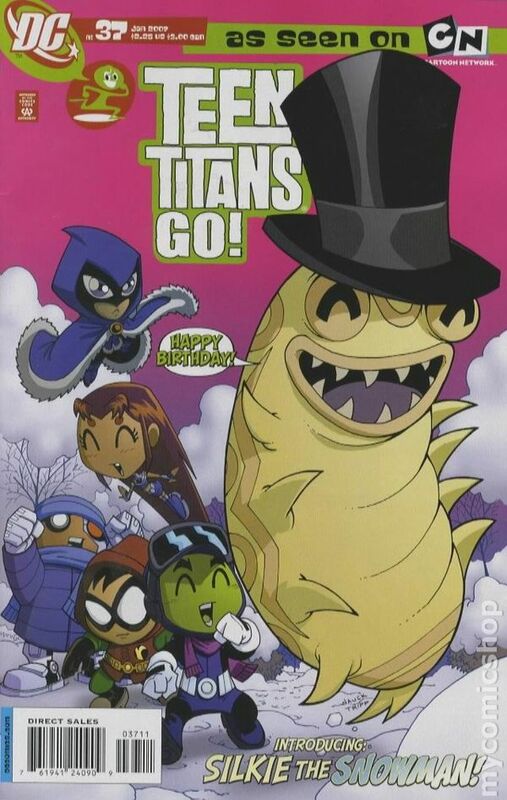 by Keith Giffen & Kody Chamberlain The series conclusion! The clock is ticking as Mitch finds his joints stiffening and the very skin rotting off of his still-functional corpse. Following a trail of clues he's discovered about the ancient pagan curse called "Tag," what will he do when he finally discovers the identity of the next person he has to... tag? Will he pass along the death sentence? Or will he let himself die, rather than take another man's life? 24pgs, FC (3 of 3) Cover price $3.99. by Fernando Ruiz Featuring another fresh appearance from Mr. Weatherbee's cutting edge niece, Double W! "Instant Chemistry": Unaware that her uncle, Principal Weatherbee continues to scare away all potential suitors, WW remains baffled as to why she can't get a date. 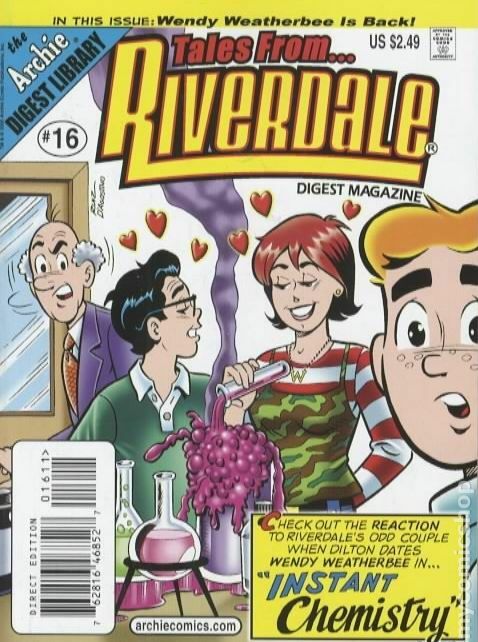 Throwing herself into her eclectic interests to take her mind off her situation, she soon learns Dilton is as interested in computers, entomology, and chemistry as she is... and the key word is "chemistry!" It's a match made in micro-chips, but can it last? Also includes puzzles, games and your chance to "Find Your Name in Print!" Digest, 192pgs, FCSRP: $2.49 Cover price $2.49. 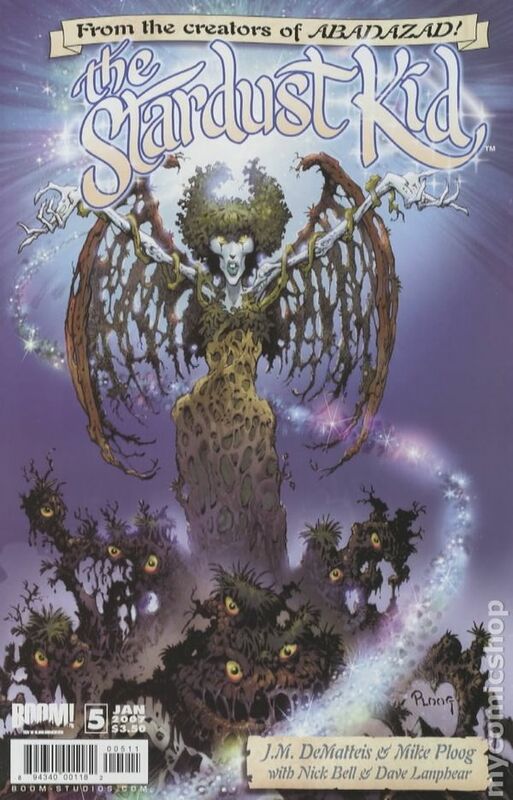 Published Jan 2007 by Mirage Studios. by Johnson, Ponce, & Parsons REFLECTIONS. 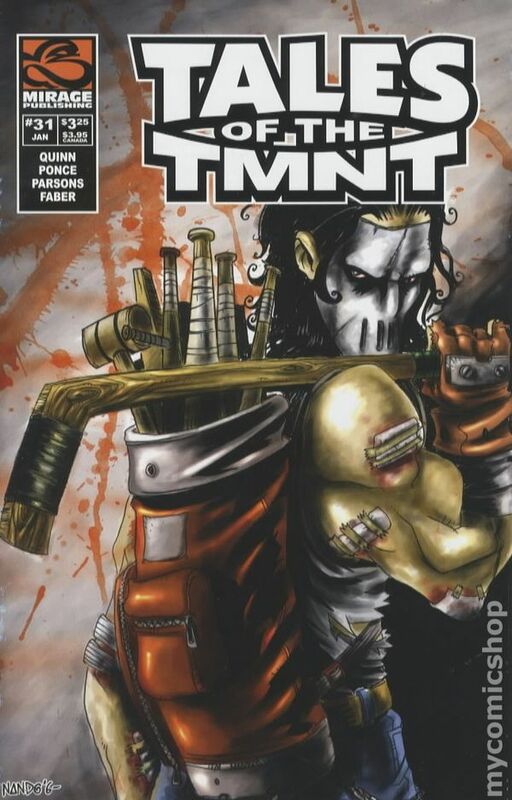 Years ago, Casey Jones was plagued by horrible dreams of a monstrous alter ego. Thinking the nightmares have ended, he heads out for an evening on the town with April and Shadow. Little does he know that his fears are coming back... with a vengeance! Cover price $3.25. Written by David Lapham and Brian Azzarello Art by Eric Battle & Prentis Rollins and Cliff Chiang Cover by Michael Wm. 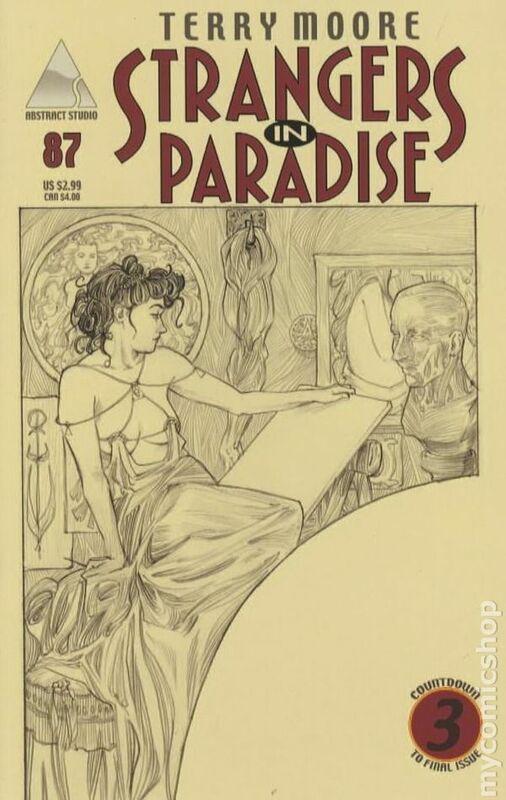 Kaluta Old habits die hard ? even for a dead cop. 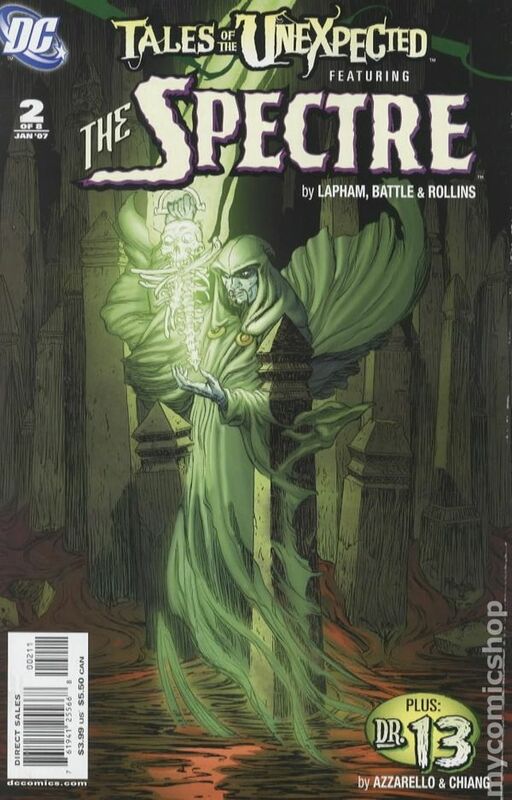 Detective Allen thinks the case is closed when a slumlord and his deranged murderer get what's coming to them at the hands of his alter ego...the Spectre! But he's in for big surprise when the cosmic authority over crime, guilt, and punishment mysteriously continues to haunt the wretched Gotham tenement. Plus, more of Azzarello's & Chiang's Dr. Thirteen! ? 2 of 8 ? 48 pg, FC Cover price $3.99. Volume 1 - 1st printing. Story and Art by Hiroki Endo. A disfigured misfit befriends a doomed yakuza outcast, a group of school kids fail to see the anger that's about to boil over from one of their own, and members of an experimental theatre troupe embark on a project that will test both their friendships and the group's grasp on reality. Softcover, 5-in. x 7-in., 232 pages, B&W. MATURE READERS. Cover price $12.95. Published Jan 2007 by BroadSword. "Hex in the City." Cover price $2.95. Limited Signed Edition signed by Jim Balent. Comes with BroadSword Comics Certificate of Authenticity. "Hex in the City." Written and illustrated by Jim Balent. Full color, 32 pages, slick paper stock. Mature readers. Cover price $2.95. "Hex in the City." Cover art: Woman holding two pink smoking pistols Cover price $2.95. Includes a limited signed and numbered art print by Jim Balent (282/500). Features a limited signed and numbered b&w art print by Jim Balent. Limited to 500 copies. (W/A) Jim Balent 'Hex In The City.' The Skeleton man's visit to the Big Apple is anything but CATatonic when recruited by the 3 Little Kittens to help take down a demented terrorist group armed with a dirty bomb! Visions of this Cataclysmic event has Tarot racing to the city! Full color, 32 pages, slick paper stock. Mature readers. Cover price $2.95. Written by Geoff Johns. Pencils by Paco Diaz & Ryan Benjamin, inks by Jonathan Glapion, Michael Lopez, Edwin Rosell, Saleem Crawford & Vicente Cifuentes. Cover by Tony S. Daniel. The explosive "Titans Around the World" story concludes with the team finding Raven! Will she bring back a Titans who died? ? 32 pg, FC Cover price $2.99. Written by J. Torres. Art by Sean Galloway. Cover by Todd Nauck. It's another holiday with the Teen Titans! As if having to take on the mischevious magician Mumbo wasn't enough, things get really crazy when Starfire's pet Silkie gets a hold of Mumbo's magic hat! ? 32 pg, FC Cover price $2.25. 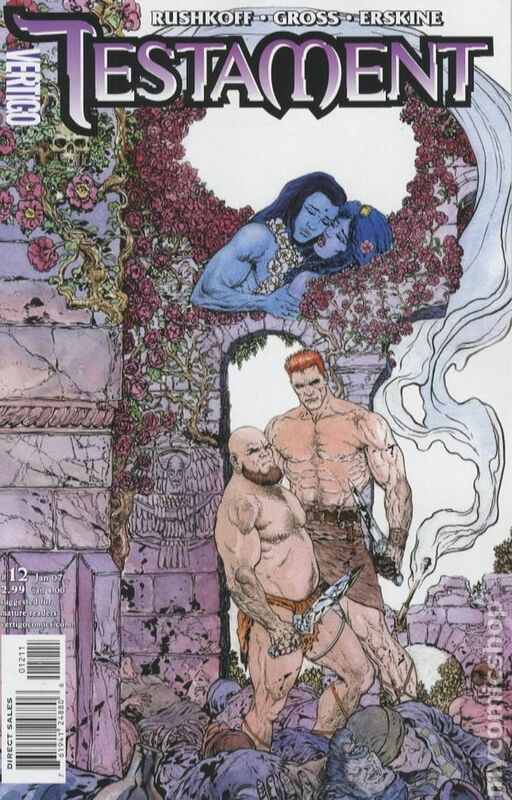 Written by Douglas Rushkoff Art by Peter Gross & Gary ErskineCover by Liam Sharp A sexual tryst between warring gods alters the story itself into a new permutation of the series Comic Buyer's Guide calls, "the most assured and original project to emerge from Vertigo since SANDMAN." With guest art from Peter Gross (LUCIFER) & Gary Erskine (THE FILTH), this tale reveals how Biblical and modern storylines diverge - as Dinah is attacked in one reality, and Miriam in the other. ? 32 pg, FC ? MATURE READERS Cover price $2.99.